Commodore Abraham Whipple, Edward Savage, date unknown, US Naval Academy Museum. 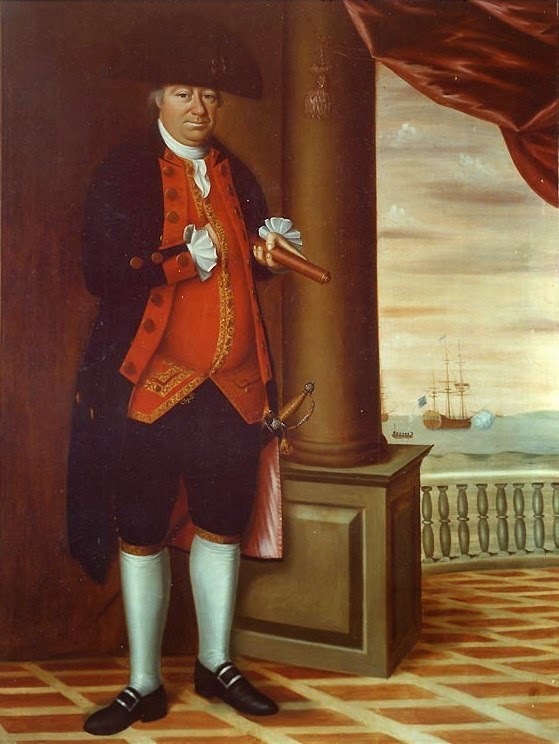 Whipple led naval attacks on the British before there was ever an American navy, much less even a ware. It was he that led the attack on the Gaspee in 1772, in which a Royal Navy officer was shot and the Gaspee burned to the waterline. Whipple's dedication to fighting the British at sea lasted throughout the Revolutionary War. Among his exploits was the phenomenal capture of eleven ships of a British convoy, valued at over one million dollars. Befitting his success and rank, Whipple wears an impressive uniform. A large untrimmed cocked hat turned over his right eye is black and bears a large black cockade. His jacket has a short standing collar with a small square of red at the front, over which sits a medium sized brass button. Along his untrimmed red lapels are large brass buttons as well, though he is missing one on the lower left. Scalloped mariners' cuffs, as we've seen on numerous uniforms this week, rest over red cuffs. Unlike those worn by other Continental Navy officers, his mariners' cuffs have only two large buttons, with one offset on the red cuff.There are matching buttons at the pockets hanging low on his coat, which is lined in pink silk. His waistcoat is something to behold. Bright red and single breasted, it is piped in a fine, wide gold trim, doubly so around the flap pockets at his waist. All along the waistcoat and pockets are small brass or gold buttons. His blue breeches match the color of his coat, and have a long line of gold or brass buttons running up from the gold lace beneath his knee. White stockings, giving the sheen of silk, run to black shoes with silver rectangular buckles. Peeking beneath the hem of his waistcoat is a watch fob, joined by a ceremonial sword on his left hip and a glass in his hand to accessorize the stunning uniform. Of all the officers featured on Continental Navy Week, Hopkins may take the prize for best dressed!